From Jesolo's favourable position near Venice lagoon, it is very easy to reach one of the most famous city in the world. At the bus station, a few minutes from our hotel, every half an hour there is a regular bus service for the boat to Venice, to arrive at the famous St. Mark' s Square or to the main Venetian islands: Burano, Murano and Torcello. Venice is a city that can never be fully understood and offers fascinating and timeless places. In your tours in Venice we recommend you to enter “Acqua Alta”, which is not just a simple bookstore, but a place to visit to get out of the usual sightseeing tours to meet the traits of the real Venice. Since in this part of Venice the high tide invades the shop, the owner decided to install a gondola and bathtubs to place the books away from the water. Hence the peculiarity of a place that has become a cult for Venetians and tourists. Libreria Acqua Alta is located in Calle Longa S. Maria Formosa, 5176 / b in the Castello district. We will be happy to advise you on the best way to get there and spend a wonderful day in Venice. Reaching Piazza San Marco from Jesolo is really convenient. Hotel Mondial is just a 17-minute walk from Jesolo Bus Station. For those who don’t want to walk, our receptionist Sandra is available to book a taxi for you. At the station you can buy the Quickly bus + boat ticket. Without stress, with a single ticket, you will get to Punta Sabbioni where you will find, without any interruption, the boat leading you to Piazza San Marco. From Punta Sabbioni to Venice you are traveling from dawn until night, so you can choose without anxiety the best time to go and go back. It is always possible to reach Punta Sabbioni from Jesolo with your car in just 30 minutes. At the ACTV boat terminal you will find many parking possibilities and every 30 minutes about a means to take you to San Marco. Here are the hours of the boats towards Venice. 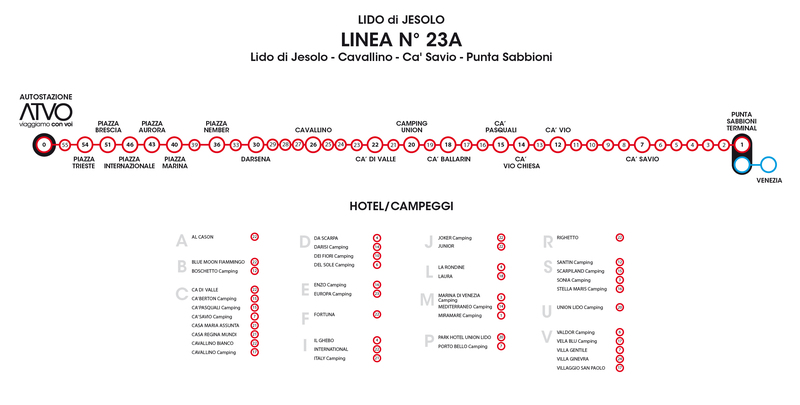 Line 14 takes you to San Marco, while line 12 leads you to the islands of Burano and Murano. The lagoon and its islands. Murano, Burano and Torcello are the most famous little islands situated in the lagoon of Venice because of their monuments and typical handycraft. Murano is famous for the artistic glass blowing, Burano for its multicoloured houses and the original lace production, Torcello for the legends about its monuments. A wonderful tour by boat across the lagoon will give you the chance to discover the history, the art and the folklore of these beautiful islands. The Carnival of Venice is one of the most ancient and charming venetian feasts. Rooted in the history and tradition of Venice, the Carnival is the most famous feast of Venice and it’s considered by venetians and its hundreds of thousands of guests as an event not to be missed! It’s a voyage of discovery into a fantastic and mysterious world, made of music, theatre, games and magic, where people from all over the world can experience the jokes, the masks and the mystery of playing hide and seek! Thanks to its mix of transgression, art, and fun, today the Carnival of Venice is considered as an event not to be missed. The Municipality choose every year a central idea taken from various cultural or show-biz themes. Several events take place throughout the city, from Carnival feasts and masked balls in private palaces to people in masks who happily invade streets and squares in search of fun… It’s possible to see every kind of costume, from 18th century noblewomen to the most inventive and creative modern costumes! The heart of Carnival is Saint Mark’s Square, with its huge stage for concerts and shows, but also the city’s other main squares act as perfect stages for masks who wish to become, at least for a few hours a year, the protagonists of another life.